See, before this awesome slogan, we were all about "the minds". Thanks, Adam. I can think of a way this works. These are not "bodies," they're the Bodie Brothers, Chet and Jim. They were away, maybe working in another shop. 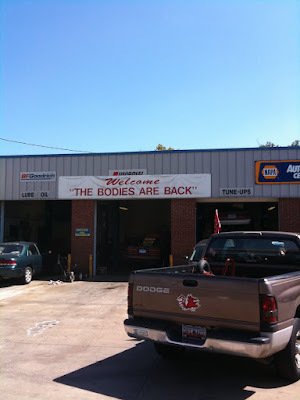 Then someone could totally say, "The Bodies are back!" and the quotes would be appropriate, if a bit redundant. However, it's a damned funny sign!